Note: This entry contains several high-quality embedded videos. It's necessary to give them time to load before attempting to view *any* of them. Searching for mention of "Amour" on our 2012 PBS program "Ebert Presents at the Movies," I was pointed by Google to one of Chaz's video reports. I remembered liking her video at the time, started noodling through all of her reports, and found myself thinking of my wife's emerging role as a movie critic. For more than 20 years, she's attended virtually every film festival and press screening with me, debated the films, made friends with the people. 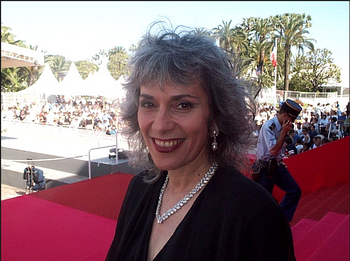 I even proposed marriage to her, in 1990 during Cannes. There's a story there. On the last Sunday of the festival, when just about everything was behind us, we rented a car because I wanted to show Chaz the grave of my great hero, Edward Lear. We drove above Nice, turned right at Italy, and just across the border came upon San Remo, where the artist and writer lies buried with his servant Giogiro and his cat, Old Foss. Returning to Cannes, we dipped down to Monte Carlo. The grandstands were still in place after the Grand Prix, there was a cafe still open, and there I offered my hand in marriage and she accepted. This event not only brought about the happiest event of my lifetime, but also taught me a lesson: Propose marriage only at a place you want to return to time and again. Monte Carlo is not that place. After Cannes we were moving on to Venice and London, both splendid choices. Why couldn't I have waited for a few days? Indeed, in 2000, on a sentimental trip back to Monte Carlo, we found the sacred cafe had been temporary. What I found in watching these videos as a group was that Chaz looks great on camera, and has an ideal television voice: Deep, warm, rich. She was the founder and executive producer of "Ebert Presents," and made these videos with director Scott Dummler and Andrew Suprenant, designer of the show's web site. Next Article: Endemic hunger in history's wealthiest nation Previous Article: What was my Aunt Martha trying to ask me?